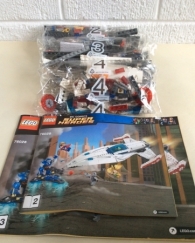 This listing is for the Darkseid minifigure and his hover destroyer from the 76028 DC Comics Super Heroes Darkseid Invasion set. What you see in the listing's picture is what you will receive. It includes the instructions, but does NOT include the box from the original set.